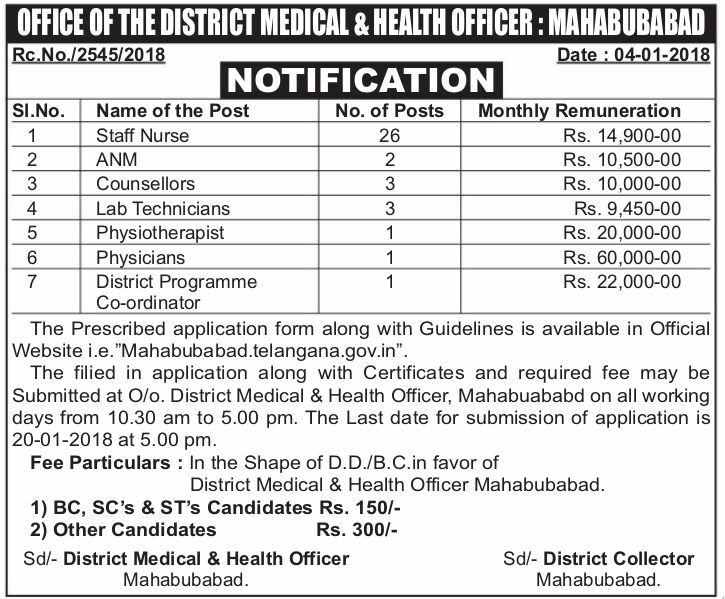 DMHO Mahabubabad Recruitment, Mahabubabad Staff Nurse, ANM, Counsellors, Lab Technicians, Physiotherapist, Physicians, District Programme Cordinator Posts Recruitment, Mahabubabad Paramedical Staff Recruitment 2018 Application Form. Government of Telangana, DMHO Mahabubabaddistrict has published the Staff Nurse-ANM-Lab-Technician-Physiotherapist, Physicians, District Programme Cordinator Posts recruitment notification and applications are invited from eligible candidates in the prescribed “Application Form” for recruitment of certain posts on contract basis under National Urban Health Mission. The contract is initially for a period of one Year and renewal will be as per the need and NHM yearly plan (PIP) and also subject to satisfactory performance. However, every year new contract has to be signed and valid for the period as indicated in the contract. The minimum age is 18 years and the maximum age is 44 years. The minimum and maximum age shall be reckoned ad on 01-07-2017 with the following relaxations allowed for reckoning the maximum age limit as per rules. i. For S.Cs, S.Ts & BCs 5 (Five) years. The Rule of reservation to local candidates is as per Presidential order. For eligible applicants recruitment will be made by awarding 90% of marks for marks obtained in qualifying examination and 10 % marks for weightage i.e., @1 mark for each completed year from the year of passing of qualifying examination. The self attested copies of the following certificates shall be enclosed with the application form. b. Marks Memos of Qualifying examination passed. e. PH certificate issued by the Medical Board.